I love pork. In the hierarchy of meat, I think it wins. It is so versatile, you can have it in so many ways, in a roast, as bacon (smoked or unsmoked, a choice within a choice! ), sausages, chops, and don't even get me started about the skin. Crackling ahoy!!! One of my favourite ways of cooking it is very slowly on a low heat. 5, 6, 7 hours, the longer the better and it can handle it. What you get is extremely tender meat (and if you are like me, ensure that you get a tonne of crackling too) which falls apart as (pay attention) the connective tissue which holds the meat together starts to break down. Bodeans does a very enjoyable version, but I was informed by a certain @foodieguide that Fernandez and Wells on St Anne's court did a daily pulled pork sandwich. Served with lashings of rocket and cider apple sauce, it is a beast of the very best kind. The only thing I would say is that it can do with a hint more seasoning, but at £5 a pop, it makes for a hearty and filling lunch. 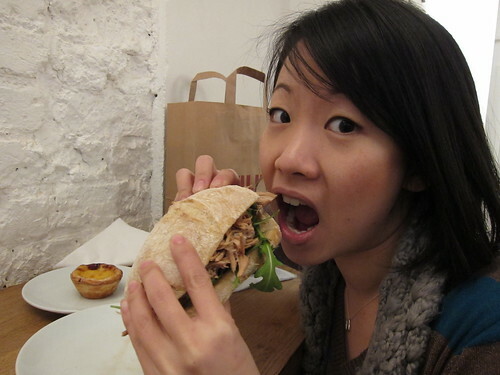 And look, here's a pic of Cat from The Catty Life trying to scoff one into her gob. She may only be little but the thing is almost as big as her head! Owwww YUH. Fernandez is still king. You and your pork loving pleasure seeking - so entertaining! Looks quite good, nice post. I disagree with what you say about Bodean's though, I've never had good pulled pork there. It's always been disappointing, though I like most of the other stuff I've tried. 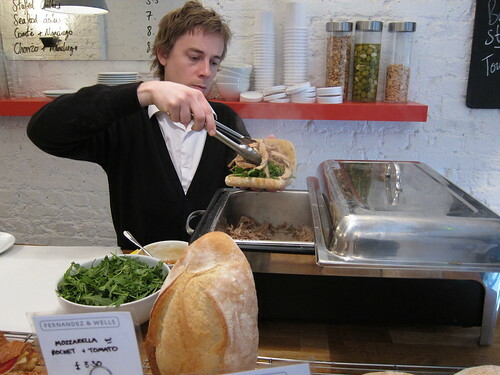 The best pulled pork I've had in London has been from Outsider Tart in Chiswick. I blogged about it. One of the owners is from one of the southern States in America, so he knows his stuff, and he did a Carolina-worthy version. My favourite meat too. I think its a Chinese thing, loving pork. Contrary to Ibzo, I quite enjoy Bodean's pulled pork so a trip to Fernandez & Wells sounds promising. 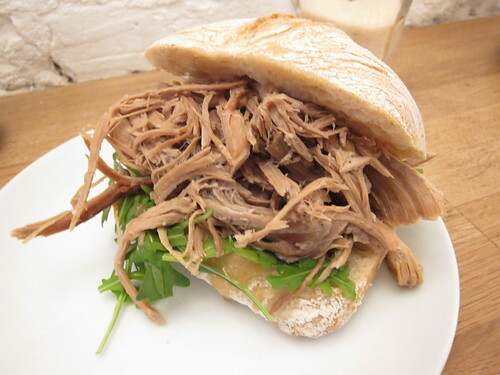 This pork sandwich looks brilliant and good value for £5. I had a similar one at Oink in Edinburgh. Awesome stuff. Great post. And very interesting to hear about the place in Chiswick. Very interesting indeed.